AVOID RUNNING OUT of Printer Supplies! We can establish your OWN "On-Site Inventory" of replacement supply products. 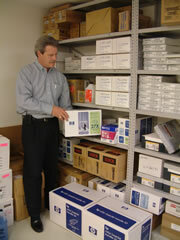 You'll NEVER RUN OUT of Laser Printer or Fax Supplies with Laser Man's On- Site Inventory Control. Your OWN Replacement Laser Printer Supplies, Parts and Toner Cartridges within Easy Reach at ALL Times!